Despite sever investment constraints, most LDCs has given official recognition to the fact that land degradation has a great effect on their economies to which Ethiopa is not an exception. This is mainly owing to the fact that most of these countries depend heavily on agriculture, which is dominated by subsistence production and widespread poverty. The Paper mainly aims at investigating the rationale of resource-poor farmers to exercise resource degrading practices. A total of 180 rural households have been selected for the study. Natural resource degradation has a great effect on the economies of most developing countries. This is owing to the fact that most of these countries depend heavily on their natural resources. The mainstay of Ethiopian economy is agriculture, which is dominated by subsistence production and widespread poverty (Grepperud, 1996). It provides employment for about 84 percent of the population, but generates only 56 percent of the GDP (World Bank, 1999). The majority of the resource poor farmers are subsistence oriented, cultivating impoverished soils on sloping and marginal lands highly susceptible to soil erosion and other soil degrading forces. These peasants constitute the poorest and largest segment of the population whose livelihoods directly depend on the exploitation of natural resources. In a such predominantly agrarian countries like Ethiopia, one of the ominous threat to food supply and thus sustainable development is land degradation, which is evidenced by the deterioration of crop lands, grass lands and forests (Dejene, 1990). In the highlands of Ethiopia (areas over 1500 m.a.s.l. ), which constitute 45 percent of the national territory but support more than 88 percent of total population, the impact of human activities on land is so striking owing to intensive cultivation, overgrazing, deforestation and expansion of frontier agricultural activity that contribute to forest and marginal land conversions. The Ethiopian highlands with inherently fertile soil and sufficient rainfall are amongst those with the highest agricultural potential in Africa, and yet they are threatened by accelerating land degradation (Shiferaw et al., 1997). There deforestation has reduced tree cover to 2.7 percent of the surface area; 50 - 60 percent rainfall is lost as run-off, carrying an estimated 2 - 3 billion tones of top soil away annually (Hurni, 1986; Dejene, 1990; Yohannes, 1998) and declining land productivity is being outstripped by population growth, the later increasing at 2.9 percent per annum (Campbell, 1991). An effort has been made to estimate rate of soil loss under different types of land usage even though it remains to be only indicative measure. Hunri estimated that rates of soil erosion on crop lands average 42 tones/ha/annum (Hurni, 1993), while rates on individual test plots of Soil Conservation Research Program in the northern part of Ethiopia reached as high as 200 tones/ha/annum (Yohannes, 1998). In his earlier work, Hurni reported that the ratio by which soil loss rates exceed soil formation rates is four to ten times greater on cultivated land than on grass land, depending on agroclimatic zones (Hurni, 1988). With multitude of conservation intervention introduced worldwide over the last 50 years, it could be expected that agricultural soil erosion would no longer be excessive. Yet, it is clear that land degradation resulting from excessive soil loss in agricultural area remains a major environmental problem through out the world (Lewis et al., 1996). With soil conservation practiced widely in many developing countries, accelerated soil erosion continues to threaten these nations’ food security and economic development. In Africa, area expansion of agriculture has been a norm for a number of decades, and today there is increasing expansion in to the fragile lands. This increasing utilization of marginal lands, especially in the highlands, is the result of growing population and its uneven distribution, limited arable land and restricted employment opportunities in the non-agrarian sectors. The rate of forest exploitation for fuel, construction and other needs by far exceeds that of supply (sustainably harvested from the resource). An increased reliance on dung and agricultural residue for fuel has reduced the organic matter content of the soil and increased erosion. The loss in nutrients and reduced water retention capacity led to the collapse of peasant farming usually triggered by drought that could have been previously tolerated. Sever investment constraints, limited markets which restrict crop selections and land tenure issues are some other factors contributing to the lack of long-term success in arresting soil erosion in many African countries (Lewis et al., 1996). From a broad perspective, factors contributing to ever worsening resource conditions in Ethiopia should also include recurrent drought, unfavorable terms of trade, unwise use of grants and loans, corrupt leadership, etc. Though all these factors are acknowledged as important, here will be discussed only some aspects of the crisis: land degradation in the context of rural poor’ soil conservation practices. Therefore, this paper tries to review major approaches followed towards arresting land degradation and continues to present farmers perception to the problem and rationality for their decision. Merhabete district is situated in Northern Shoa zone of the Amhara Regional State. The topography of the district is characterized by dissected steep slopes, valleys and ragged landscape consisting of table mountains, delineated by the Wonchit and Jemma rivers. Its altitude ranges from 1050-2650 m.a.s.l. associated with bimodal and erratic rainfall of 600-1146 mm per annum. The predominant soil type is vertisol found mainly on the plateau, but also Redzina, Regisol and Verticambisol can be found in the highlands. In the lowlands the sandy Arenosol with limited water holding capacity is predominant. The total area of the district is estimated to be about 121,000 ha. of which 27% is cultivated, 53% is grassland and fallow, 10% is bushes and shrubs and 10% is unused land. The major proportion of the area lies in Kolla (20%), Weyna Dega (73%) and Dega (6%). Rainfed mixed farming is predominant occupation in the district with an average land holding of 1.6 ha. per household, but fragmented into different agro-ecological zones. Even though the diversified nature of the climate favors the growth of variety of food crops, backward farming practices, shallow topsoil, rainfed agriculture and shortage of draft power make farming extremely risky and difficult business. The current land use indicates that the major crops grown are sorghum (47%), teff (30%), barely and wheat (15%) and pulses and horticultural crops (3%). Crop yields are low as compared to the national average and in years of irregularities production can fall below 50% of the normal amount. Reports from Office of the Agricultural Development reveal that nearly the third of the household don’t posses any ox, a further 35% owning only one ox. Use of inputs such as fertilizer and improved seeds is very negligible. Degradation of natural resources is extremely high, soils are already very shallow to such a degree that technologies affordable by farmers can hardly bring about any major change in the short-run. Many plots currently under cultivation should have been abandoned long time ago. Even the marginal lowlands are being occupied by farmers who are pushed from adjacent highlands due to population pressure and degradation is being intensified in the fragile areas. In such ecologically degraded areas and where the level of poverty and land degradation are very deep rooted, resource poor farmers have developed their own logical explanation for their activities, the understanding of which can significantly contribute towards the success of overall environmental rehabilitation. Under appropriate circumstances they also practice various soil and water conservation techniques which should be well considered in the pursuit of achieving increased agricultural production that in the long run empowers the poor and help to attain sustainable self-reliance. Realizing the rapid deterioration of the natural resources in Merhabete District, Menschen fuer Menschen Foundation has initiated an integrated rural development project since 1991. The project has achieved impressive results towards conserving and rehabilitating natural resources through provision of various incentives, training, institutional support, coordinating participatory activities and continuous follow-up. This study mainly aim at investigating the rationale for the resource poor farmers to exercise resource degrading practices and is based on a survey conducted in Merhabete District. Six Development sites were selected purposively to represent most of the major agro-ecologies and farming systems in the District, from which sixty households were selected randomly to be interviewed with the help of structured questionnaire. Discussion with development agents for each site and a plenary session with key informants provided valuable information to fill missing information in the questionnaire. Environmental processes such as soil formation, leaching and erosion occur with or with out human interference, but for these processes to be described as degradation, they should relate to its actual or possible use by human being. Several definitions forwarded to express land degradation echo its negative impact on environment accelerated by human activities. In this context, land degradation is an environmental process influenced by human activity that will lower the actual or potential capability of agricultural land or land suitable for agriculture to provide goods and services in a suitable way or in the way land users demand (Blaikie, 1985; Blaikie and Brookfield, 1987). The word degradation, from its Latin derivation, implies "reduced to lower rank". The rank is in relation to actual or possible uses, and reduction implicates reduced productivity of land as input resource for those who use the land in the process of production. Land productivity is the rate at which a particular land site can produce per unit land area with in a specific time period, i.e., a cumulative biomass of particular crop (Tivy, 1990; Olson et al., 1994, Bruce, 1995). It is affected by many factors and also difficult to connect one variable with the other. Generally, good soil quality is associated with higher productivity and resistance to erosion. A productivity decline can often be restored by economically feasible inputs, and in that sense it is a social phenomenon (Lal, 1987). There are many forms of land degradation which are often strongly linked to one another. A 1983 Food and Agricultural Organization (FAO)/ United Nations Environmental Program (UNEP) study distinguishes between soil erosion by water and wind, soil mining, salinity, leaching, biological and physical degradation (Graaf, 1993). Morgan (1995) described soil erosion as two-phase process consisting of the detachment of individual particle from the soil mass and their transport by various erosive agents such as running water and wind. When sufficient energy is no longer available to transport the particle, the third phase, deposition occurs. Soil erosion accounts for the major form of land degradation in developing countries, and at the same time, it is difficult to isolate and measure its impact on productivity even when the means and resources are available. The dilemma in measuring soil erosion in developing countries is well documented by Blaikie who stated that lack of resource, sophisticated equipment, and trained manpower and the need for longitudinal measurement make it difficult to measure soil erosion (Blaikie, 1985). The effects of soil erosion includes removed topsoil, land entrenched by gullies, land covered by sand and silt deposits, clogged ditches and canals with sediments, silted up reservoirs and dams. Even though it remains hard to present a clear picture of the effect of soil erosion on crop productivity, its direct effects can be loss of rooting depth, reduced soil fertility, decrease in organic matter and reduced water retention capacity of the soil. Loss of arable land to gully is also of important consideration. Whatever form it may take, land degradation is a result of human activities, directly or indirectly, and is something that threatens the base of human livelihood. Many of the techniques of resource utilization and conservation require collaboration among individuals, and it is believed that much of the resource degradation results from lack of such collaboration. Therefore, we need to extend our understanding of individual and group decision making in order to effectively analyze the perception of resource degradation and adoptions of techniques to mitigate it. Since individuals’ land use decision making are patterned by the structure of the society that they create through their interaction over time and space, social scientists have suggested that collaborative actions are easier to understand in the context of the role of institutions. Institutions are the social rules, conventions and other elements of the structural framework of social interactions. This framework is taken for granted in much of the mainstream economics, and often pushed so much in to the background that many of its central propositions are sometimes stated with a false air of institutional neutrality (Bardhan, 1989). The laws of market demand and supply are simply applied to resource allocation without being fully conscious of the complex of institutions on which contracts in actual markets crucially depend. Institutions include the organization in which resource users participate in every day life, but they are better described as the way things are done in a society, or standardized mode of behaviors. They can be perceived as the set of rules that structure every day action. They strongly influence who can make what decisions, and how these decisions are constrained, prohibited or required. They allow people to have expectations about the behaviors of others, which radically reduce the uncertainty that would otherwise characterize social institutions. They embody the process of monitoring the behavior of others and the enforcement of normatively patterned behavior. In this context, institutions vary from such practice as telling the truth, and departing from rules and roles of everybody to organizations such as households, firms, agencies of the state etc. Resource users seek to advance their perceptions of their interests through such organizations, subject to the constraints they face. The importance of identity should be recognized, too, as it is a major factor in determining the perception and action of individuals and societies. The differing endowments and motivations of individuals are aspects of differing identities. Economists have already recognized that identity is a key to reducing transaction costs by reducing uncertainty and establish trust (Pollack, 1985; Ben-Porath, 1980, Cited in Biot et al., 1995). In this perspective, a family is an efficient economic institution because members have identity of being known and predictable. The existence of multiple identity may bring difficulties for the assessment of perception and action of an individual. A man as a father and farmer may have an identity embodying trusteeship of the land for his descendants, but as a household head and petty trader he may feel that it is appropriate to exploit land in the process of provision and accumulation. Gender analysis also helps to explain who causes land degradation and why, and it indicates how gender identity affects the likelihood and characteristics of any ameliorating actions taken in response to land degradation. In most resource poor rural households women and female children bear the main burden of natural resource degradation. As the main gatherers of fuelwood, fodder and water from away places, their workdays have lengthened (Arya, 1995; Arya and Samra, 1995). Whether a household uses its scarce resource to plant trees for future supply of fuelwood which is predominantly women’s interest, or to acquire more cattle or land for cultivation which is men’s interest, will depend on the bargaining power of the different identities in the household and its position in societies. Most empirical studies on land degradation analyze the impact of physical factors like topography, climate and soils, farming practices and population pressure on soil erosion. These analyses suggest interesting causal relationship that shed light on the impact of population pressure on resource degradation. When the population-land ratio increases, the process of extensification and intensification takes place (Grupperud, 1996). The causes of land degradation also reside in the power that created particular form of agrarian relations, land control and exploitation (Tsighe, 1995). The degradation of land in Ethiopia is closely intertwined with the country’s political economic relations, which change the resource access profile of Ethiopian societies. The attempts made to increase large-scale farms and the resettlement program of 1980s, for instance, have aggravated the situation and led to disruption of the traditional land management system. Therefore, far from being a purely technical problem of soil science or plant nutrition, the core of land degradation problem is social and institutional. The perception of land degradation as purely technical (physical, chemical and biological) problem need to be reconsidered. An alternative and broad perception focusing on institutional, social and economic considerations is required in understanding the principal causes of these problems, and also prescribe innovative policies to reverse environmental degradation in these areas. Most developing countries have given official recognition to the fact that current agriculture, characterized by an expansion of impoverished smallholders and land scarcity, is making traditional fertility maintaining impossible, and so tried to devote their scarce resources to land rehabilitation. In the course of history of soil and water conservation, in order to mitigate the negative consequences of land degradation, various approaches has been followed. A study carried out for the World Bank has identified three main approaches towards dealing with the difficulties of land degradation in developing countries, which are neither strictly sequential in their historical development nor mutually exclusive: Classic, Populist and Neo-liberal (Biot et al., 1995). The classic approach to soil and water conservation (SWC) rests on the assumption that the extent of and solution to the problem of land degradation are well known, but the problem is to get people to implement them. It identifies mismanagement of land by users, which are ignorant, irrational and traditional, and also their subsistence fundamentalism as a core problem in SWC practices. Lack of any account of the position of the participant, the natural resource users themselves, and the extreme reliance on experts constitute the key point. Many soil and water conservation projects in developing countries failed to take into account the factors determining resource users’ land management decisions and collapsed shortly after the intensive technical assistance and the special incentives and subsidies were no longer available. The typical response to failures with this approach has been to find "escape hatches" (Clay and Schaffer, 1984), blaming unfavorable weather, lack of cooperation by different governments, lack of political will or lazy and uncooperative farmers. The view from another approach sees failures in SWC in terms of technical failures (through inadequate or misapplied research), lack of fit between techniques and local farming systems and livelihood strategies, and lack of participation by land users in designing and implementing resource conservation practices. The successful adoption of conservation practices in appropriate circumstances led to close attention being paid to rationale for classic SWC approaches, and indeed to the development of a range of studies in indigenous practices and that constitute the Political Economy of Conservationism (Blaikie and Brookfield, 1987). Attention shifted from blaming backward farming practices for accelerating degradation to identifying the constraints that were the primary causes of land use practices that led to degradation. The processes of marginalization and incorporation of pre-capitalist societies in to the market created new constraints upon decisions of local people, which lead them to take decisions, which degraded their environment. Growing inequality and socioeconomic differentiation within the peasant communities and their relationship with traders and state agencies were seen to lead to impoverishment of small farmers, which in turn led the poor to over-exploit their environment. These critics labeled against classical approach led to the development of the so-called populist approach to SWC in the late 1970s. The proposals that arise from this approach requires (calls for) site-specific participatory study and design using a multi-disciplinary approach by teams of specially trained and oriented natural and social scientists in combination with local farmers, resource users and organizations. Indigenous technical knowledge is being taken seriously and new forms of constructive dialogue between resource users and scientists continued to be developed. However, the populist approach is not an approach that can be applied on a widely expanded, let alone, universal basis. Successful examples are often subsidized, unsustainable, and unreplicable on a large scale. It is argued that it may be more appropriate to the activities of NGOs, not to those, which work with in the state. The approach has become central to many NGOs not only to SWC but also to broader rural and agricultural development projects. Even as the populist approach is being integrated into establishment thinking, the neo-liberal approach to SWC has been also advocated. The later approach holds that suitable technologies presently exist or can readily come in to existence; the problem is to understand the present structure of incentives that prevent land users from adopting them, and to design incentives that will induce adoption. This approach is typified by giving a central role to population growth in exacerbating pressure on natural resources, careful construction of explanations of land degradation into land users’ production strategies, and re-establishes the certainty that technologies for SWC exist, problem definition is not problematic, and that it is the matter of getting farmers to adopt these technologies through extension and appropriate incentives. There was a wide believe that traditional societies were efficient managers of their natural resources. Meaning that they followed rules and patterns of behavior that geared towards self-sustainability. However, the concept of sustainability is problematic because it is often used in a loose way, which lends itself to several interpretations. The term sustainability is first advanced by the International Union for Conservation of Nature and Natural Resources (IUCN, 1990; Lele, 1991, Cited in Vosti et al.,1997). Gordan K. Douglass identifies three alternative conceptual approaches to the definition agricultural sustainability (Douglass, 1984). The first approach defines sustainability as the capacity to meet the expanding demand for agricultural produce on increasing favorable terms. The second approach regards sustainable agriculture as an ecological issue, and specifically, an agricultural system which depletes, pollutes or disrupts the ecological balance of natural system is unsustainable. The third group emphasizes on sustaining a broad set of community values and calls for strengthening and revitalization of rural culture and rural communities and thereby promote self-reliance. Even though a variety of definitions to sustainability has been suggested by many in the recent past, most tend to be rather narrow in that they emphasize only on a single dimension of the issue (Ruttan, 1997). To some sustainability involves mainly the enhancement of environmental quality and the resource base; where as others emphasize the economic viability and/or the social endurance of agricultural systems (CGIAR/TAC, 1989; Nijkamp et al. 1991). The definition that has gained widest acceptance and diffuses the concept from the confines of its agro-ecological origin to development in general is that adopted by Brundtland Commission which states sustainable development as development that meets the need of the present with out compromising the ability of the future generation to meet their own needs (World Commission on Environment and Development, 1997). Accordingly resource utilization and management to be considered sustainable, it has to maintain or enhance environmental quality, satisfy current and future demand of society for food and fibers, and assure the economic and social well being of producers. Hence, there are several problems regarding the view that traditional societies are efficient resource managers. The first problem arises from the fact that a society in which population pressure has made fallowing, slash-and-burn cultivation and other traditional soil maintaining practices nonsustainable, and which has subsequently converted forests and marginal lands in to permanent agricultural fields cannot be considered as managing its resource sustainably. To meet the criteria such society would, for instance, need to limit its population size so as to match the available land resource with in the confines of existing technology. The societies with which the upholders of conservationist’s thesis seem to be mostly concerned are those which operate or are supposed to operate in a more or less static environment: peace reigns, population is stationary or it is implicitly assumed to be dully controlled to match the resources; there is no technical change, economic activities are not disturbed by new trade opportunities (Baland et al., 1996). Moreover, the livelihood of their members should depend to a large extent up on a single resource the conservation of which therefore constitute a crucial determinant of their present and future survival capacity. The second issue worth mentioning is that traditional management practices may be coincidental rather than intentional. A situation in which conservation is clearly unintentional arises when the technology is so primitive that it cannot enable the people to affect the level of the stock through their productive effort, which may happen when, beyond a certain limit, the cost of exploiting a resource becomes relatively high (infinite), and and/or when the population is sufficiently very few compared to the amount of resources as to make over-exploitation impossible. A society may be considered to manage its resources sustainably if the desired outcome has been achieved purposefully, through the operation of ecologically oriented motives. When this is not the case, because such an outcome has resulted either from motives unrelated to the ecological concern or from exogenous, uncontrollable events, the society is not an efficient manager of its resource towards self-sustainability although the resources have been maintained. The focus of farm-level decision making must be most important in any attempt to understand why land users do as they do. It should be recognized that decisions about land management are taken by an enormous variety of combinations of different people. Heads of farming households are seldom the only ones to be involved in making decisions of this kind, rather decisions emerge from complex bargaining, confrontations and complimentarities between various individuals. Certain land use management practices require collaboration not only between individuals and households, but also between communities and some require support from local state structure through local public expenditure. The degree of collaboration by each actor largely depends on how the problem is perceived. Many resource-poor farmers may perceive land degradation as a low priority problem relative to subsistence of basic needs in the short run, and actions following these perception may cause significant and increasing degradation-related problems. It is often the case that the resource-poor farmers are the most affected by land degradation, and the most aware of it. Because land degradation often becomes an immediate and life- and livelihood-threatening crisis, a question of survival. But the poor are simply obliged by their circumstances to act in ways that further undermine their capacity to fulfill their own basic needs and the longer-term sustainability and viability of their physical environment. There is no single method either for evaluating the on-site and off-site effects of soil degradation or for investment appraisal of soil conservation technologies. The formal analysis of land degradation with the optimal control models by Burt (1981) and McConnell (1983), and an erosion damage model by Walker (1982), referred to as BMW by Coxhead (1996), posit price taking producers who aim to maximize the NPV of outputs. These producers’ decisions are conditioned by a measure of soil quality that captures the effects of past agricultural practices, then the farmer is essentially to find the optimal rate of soil depletion. Topsoil loss and diminution of soil organic material progressively reduce farm yields. The relationship between land degradation and decline in crop yield can be approximated by a negative exponential function in which crop yield decreases each year by a specified percentage of the previous years yield (Stocking and Peake, 1986). Therefore, for a given price, and without compensating increase in fertilizer input, the profitability of planting is a declining function of time. Farmers should decide each time whether or not to follow the path towards soil conserving practices by comparing the cumulative loss in yields multiplied by the producer price of the crop and discounted to take into account the time preference for money to give the net present value (NPV) of the current erosive practice with that of adopting a soil conserving one. For some rate of erosion-related yield decline, it may become profitable to adopt soil conservation even if the current costs of doing so are higher than for erosive practice. Resource users also incorporate (consider) the possibility of abandonment of land and migration for off-farm employment and/or permanent out-migration in their decision to control soil degradation. In actual fact, there are frequent circumstances in which it is individually rational to degrade a natural resource. Poor rural households have generally only land and unskilled labor as their principal asset, and thus few human and physical capital endowment. These households live close to their subsistence level and have very few alternative income earning opportunities. Therefore, the income they derive from the exploitation of the resource should meet their subsistence requirements in each period. If the conservation of the resource involves costly investment that have a long gestation period, it may happen that they may not be able to bear such a sacrifice. Subsistence constraints may, therefore, drive resource-poor farmers to draw down the resource at their disposal to a shut down level. Moreover, the imperfect capital market with the effect that farmers are not able to obtain loan which would help them to undertake the necessary conservation investment, and the insecure land tenure system and/or imperfect land market which hinder farmers under a binding subsistence constraint to sell immediately the land to a new owner who would make better use of it, are the conditions for the materialization of such decision (Baland, et al 1996). The two possible paths that have just been characterized are illustrated in Figure 1. 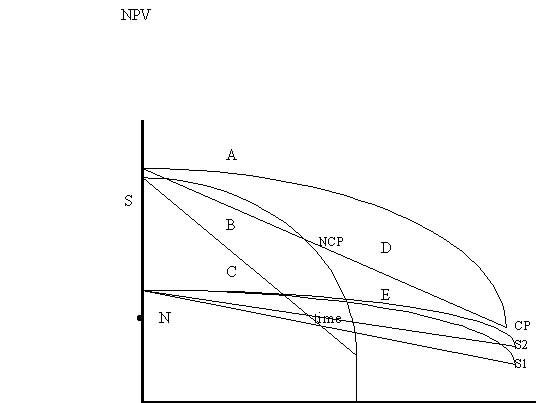 The vertical axis in figure 1 measures the discounted return and therefore, the area under the curve is interpreted as net present value of returns following the corresponding path. Note that the non-conservation path is initially more profitable, which results from the fact that adoption of conservation practice requires either an initial investment or use of less productive practices. S represents the subsistence income of the farmer who has no alternative income earning opportunity. The net present value of returns from following conservation path is given by the area ( B + C + D + E ) while that achieved by following that under which resources are gradually destroyed is ( A + B + C + E). N represents the shutdown point of the later strategy. Whether a conservation or non conservation path is preferred, from the NPV perspective, depends on whether A is greater or less than D.
The subsistence requirement (S) is crucial to determine whether the resource will be conserved or damaged to the shut down point. The higher the S, the less will be the area D, that is the probability that A exceeds D increases, the more likely that the resource will not be conserved. As population increases, the subsistence requirement increases in proportion to the number of dependents in the farmer’s family, with the effect of rotating S1 upwards to S2, and a higher return need to be extracted from each unit of land to maintain subsistence level, and area D will ever diminish. An important circumstance that may lead individual farmers to degrade land occurs when the rate of return on a conservation investment falls below the return achievable by allocating factors to alternative use. Thus, it should be evident that rational agents can have an incentive to degrade natural resources even when such resources are under private property. A producer cultivates land which has initially a given level of productivity, and the higher the soil level the greater the output per unit of area. A production input can be applied to this land which generates output according to a determinate production function describing the prevailing technology: The function has a standard property, including diminishing returns to the production input. Yet applying this input causes damage to the soil, reducing the future productivity level. Soil degradation and the consequent future losses of output are inevitable, even if a conservation input can also be applied with the effect of mitigating damage to soil. Use of conservation input does not contribute to immediate production and in fact, it even reduces it by diverting resources from directly productive activities. To put it in other ways, conservation is costly in terms of both conservation expenditure and foregone revenue from production. In case the resource is not conserved either because the farmer does not deem it worth to do so, or because he cannot bear the necessary cost, then the optimal path leads the farmer to draw down his soil to the level that he is forced to shut down production. Insecurity in land rights is generally regarded as one important deterrent to conservation investment (Southgate, 1988; Sherr & Yadav,1996). When a system of property rights fails to provide sufficient security to enable individual users to reap future benefits from their investment, they may fail to undertake otherwise profitable and environmentally benign investments. The most reliable indicator that a farming household will have on the effect of land degradation on future land productivity is through land prices (Barbier, 1997). Due to the absence of such prices or distorted rural land markets, however, the cost of land degradation in terms of forgone future crop productivity may not be reflected adequately. The land proclamation of 1975 abolished land lordism in Ethiopia by declaring land the collective property of the people, the state became the real owner of the land. Farmers are given only usufruct rights, but lost control over the land and the power to make informed decision relating to its proper use. Much ecological and economic flexibility was lost, and farmers were forced to engage in production practices that rapidly exhaust soil fertility. Once cultivators were alienated from the land, they tended to exploit it at the expense of future needs. If there is virtually no market to sell his land and the farmer has available to him alternative uses of his labor resource either participating in labour intensive public works or migration possibilities, he will then prefer to degrade it in order to reap the highest possible returns from overexploitation and, thereafter, to switch to his off-farm alternative activities. Inadequate market and institutional development in rural areas coupled by improper incentive structures can discourage conservation pathways of resource utilization. Rural capital markets which are usually dominated by informal sources characterized by segmentation, rationing, and high rate of interest on small sums offered for short duration, by no means are able to support conservation interventions. The lack of effective rural credit markets may distort the farming household’s decision as to whether it is worthwhile investing in protecting the soil because of its future productivity and income potential, as opposed to exploiting it for immediate gains today. There is a severe shortage of empirical information on the effect of land degradation on productivity. It should be noted that only a small periodic decline in the topsoil accumulated over a number of years brings drops in food production leading to the condition of famine. Insufficient understanding of the causes, consequences and preventive measures of land degradation hinder the adoption of productivity enhancing and resource conserving technologies. Governments of developing countries often unwisely intervene in to otherwise more or less smoothly functioning markets and distort existing structure of incentives. These misguided interventions impede the market mechanism from allocating resources more efficiently and exacerbates existing market failures. Prior to 1991, the Government of Ethiopia has long invoked on measures to stabilize producer price, usually based on a system of administered prices under monopolistic marketing arrangements. These administered prices have driven the cost of tradable inputs below their social opportunity cost, there by encouraging their overutilization. Producer prices for agricultural products have been depressed, in some cases, below the cost of production and the world parity price, which may reflect the social opportunity cost of the resource. This has reduced income of the already poor farmers and so further discouraged investment in land conservation. Chronic underproductivity in the subsistence agricultural sector has been blamed for the continuation of the steady increase in land degradation in developing countries (Tole, 1998). In much of Ethiopia, rural infrastructure is poorly developed, agricultural research is at its stage of infancy, and new technologies for production or conservation are largely of short supply. Improved seeds, irrigation and fertilizer are used only on 0.71 percent, 0.97 percent and 25.4 percent of cultivated fields. The average rate of fertilizer application per hectare of cultivated land is 17.5 kg/ha (CSA, 1996). The impoverishment of resource users which forced them to rely on less productive techniques has also encouraged an extreme degree of risk aversion which in tern inhibits the adoption of technological innovations. Impoverishment and underproductivity encouraged a myopic approach to intertemporal allocation of resources, since the costs of the resource conservation must be subordinated to the needs of immediate survival. The farmer is also confronted with subsistence constraint and cannot borrow or insure himself to meet basic consumption needs when his agricultural output falls short of these basic needs in any period. If the conservation strategy entails current expenditure or less intensive use of his land so that his subsistence constraint is violated, he cannot adopt this strategy even if it may be very profitable in the long run. Land degradation has become a topic of almost universal interest to Ethiopia. One could say that every one, i.e., the farmers, policy makers, development agents and NGOs, wrestles with it, although what the wrestling match entails may differ for each actor. Even though relatively few conservation projects in Ethiopia has been externally evaluated or made pubic internal reports (Ermias, 1989), available evidences indicate that extensive conservation works have been initiated even since 1945, when Forestry and Wildlife Division of Ministry of Agriculture attempted, through legal actions, to protect forest areas. But most of the conservation measures were neither effective nor sustainable (Champbell, 1991). In some cases they have even threatened the livelihood of an increasing number of poor farmers through the removal of arable land for afforestation. Land degradation in Ethiopia has been variously attributed to peasants’ ignorance of proper land management practices or even to their sheer laziness, and they have not been traditionally conservation minded (Waktola 1988). This classic view of explanation suggests that land degradation is essentially the land users’ fault. 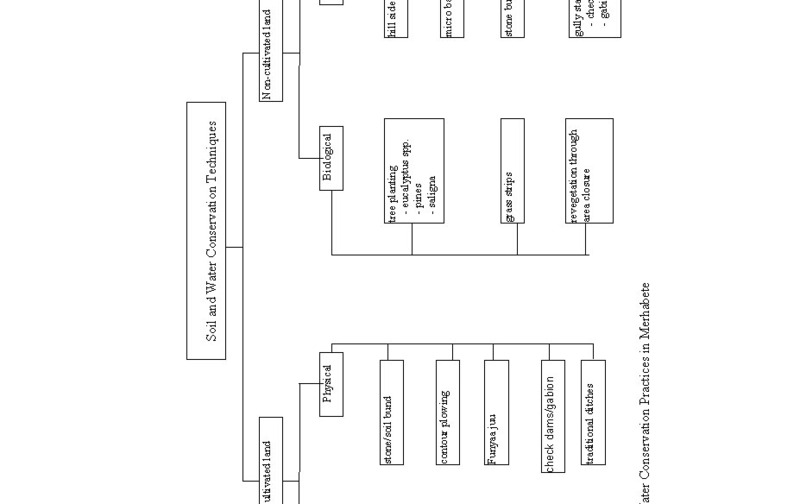 However, a close inventory of soil and water conservation techniques in Merhabete District identifies a number of techniques successfully employed by land users most of which have their origin in the traditional knowledge but were adapted to the present environmental and social circumstances (Figure 2). In recent years an increasing attention has focused on the natural rehabilitation of Merhabete District particularly after the drought and famine of 1972/73. During the past three decades considerable investment has been made to rehabilitate badly denuded lands and to check further deterioration of land resources. How ever, the large magnitude of the problem required the government to alter its strategy which was based on aggressive extension philosophy and on the assumption of superiority of introduced technology with a view to taking more account of local concerns and involving NGOs in soil and water conservation. The attempt to involve NGOs in rehabilitating natural resources of Merhabete through provision of appropriate incentives and creating conducive institutional set-up for community participation has been accepted by MfM foundation. MfM rests on participatory strategy relating to environmental rehabilitation which contributed greatly to its relative success in creating a sense of ownership by resource users. It has created conducive atmosphere which allow free exchange of knowledge and increased social acceptance of innovations. It provided a framework to resolve conflicting interests through sharing of ideas and knowledge. There is now a general perception by farmers that the natural resource base has dwindled drastically and the situation will continue to worsen unless stringent resource management is put in place. Various soil and water conservation practices have different priorities depending on the agroecology of the area, the soil type and depth, position of the site within the landscape. The Dega agro-ecology is characterized by higher rainfall, flat topography and relatively deep soil. There farmers practice soil bunds reinforced by grass strips on cultivated lands. Traditional ditches are very common practices to drain excess water of the cultivated fields to its natural water ways and reduce its erosive potential in Dega and Woina Dega agro-ecologies. Grass strips using vetiver grass and planting trees such as Sesbania and acacia have been successfully adapted to the traditional farming practices and supplement the livestock sector which remained to be the most important source of power in the small holder farming in addition to their main purpose of sustaining the soil. Terraces are common practices and seem to form part and parcel of the natural landscape of Merhabete. In most cases terraces are dismantled between 6-8 years so that the sedimented fertile soil could be distributed over the field and a new bund will be constructed. This, of course, has reduced the adoption of tree planting within the cultivated land to reinforce bunds. Non-cultivated lands which are usually sloppy and stony are treated with hillside terraces, checkdams, gabions and microbasins. In some cases revegetation through area closure and tree planting are integrated to the above practices. In general, the attempt made to increase the awareness of the farmers to conserve the natural resources, to strengthen farmers’ capacity to resolve the conflicting interest between production and conservation through sharing of ideas and knowledge has resulted in successful integration of the indigenous knowledge and modern soil and water conservation techniques in the district. This is proper illustration of how proper intervention programs encourage farmers to pursue conservative land use practices, the absence of which can force the resource poor farmers to develop a short term planning horizon, focusing on only the coming harvest. In Ethiopia, as in most developing countries, small and resource poor farmers using traditional farming methods produce the bulk of food crops. One of the most striking problem of the last few decades has been the coincidences between deepening poverty and accelerating land degradation leading to drought and famine. The major prerequisite for mitigating the problem and for attaining sustainable agricultural development is the formulation of appropriate resource management policy based on firm understanding of the farming community and their day-to-day practices in making decision of land use. Although land degradation is a result of human activities and something that threatens the base of human livelihood, the view that it is a result of the cultivator’s imputed negligence is unwarranted. The survival of smallholder farmers depend on land resource and such societies cannot afford to be lazy or unaware of destructive practices. But as subsistence seekers, they were forced to over-utilize land or simply pushed in to marginal land by circumstances and institutions such as technological stagnation, imperfect capital and insurance markets, insecurity of land rights, imperfect information, prohibitive transaction costs and misguided policies, which are far beyond their control. Immediate survival needs and food security are overriding objectives driving household behavior, thereby shortening the planning horizon of the poor. The immense effort made by the government and NGOs in soil and water conservation projects employing various approaches has done little to avert the recurrence of the problem. Peasants are unlikely to adopt land degradation control measures (practices) unless they anticipate that the shift to a conserving practice will improve their immediate well-being without violating their subsistence consumption. When immediate survival is threatened, households without sufficient assets to hedge against risks may lack the enthusiasm to sacrifice current consumption to undertake resource conservation investments needed to meet future consumption. Thus, measures that enhance productivity of land and counter land degradation and at the same time that minimize risks of adopting new practices are needed to promote sustainable land use in degrading areas. Such policies may include technical change, institutional support, market access through investment in rural infrastructure and provision of targeted incentives. Arya, S. L. and Samra, J. S. 1995. Socio-economic Implications and Participatory Appraisal of Integrated Watershed Management Project in Bunga. Technical Bulletin T-27/C-6, Central Soil and Water Conservation Resaerch and Training Institute, Research Centre, Chandigarh, India. Baland, J.-M. and J. -P. Platteau, 1996. Halting Degradation of Natural Resources: Is There a Role for Rural Communities? Clarendon Press, Oxford. Bardhan, P. (ed.) 1989. The Economic Theory of Agrarian Institutions.Clarendon Press. Oxford. Ben-Porath,Y. 1980. " The F-Connection: Families, Friends and Firms and the Organization of Exchange ". Population and Development Review 6 (1): 1-30. Biot, Y., P.M. Blaikie, C. Jackson and R. Palmer-Jones, 1995. Rethinking Research on Land Degradation in Developing Countries. World bank Discussion Paers 1289. The World Bank, Washington D.C.
Blaikie, P. 1985. The Political Economy of Soil Erosion in Developing Countries. Longman. London. Blaikie, P. and H. Brookfield (eds). 1987. Land Degradation and Society. Methuen Press, London. Blume, H.-P., H. Eger, E. Fleischhauer, A. Hebel, C. Reij and K.G. Steiner (eds), 1998. "Towards Sustainable Land Use: Further Cooperation Between People and Institutions". Advances in Geoecology 31, Volume II. Catena Verlag GmbH, Reiskirchen. Bruce, R. R., G. W. Langdale, L. T. West, and W. P. Millor, 1995. "Surface Soil Degradation and Soil Productivity Restoration and Maintenance". American Journal of Soil Science Society. 59(3):640-660. Campbell, J. 1991. "Land or Peasants? The Dilemma Confronting Ethiopian Resource Conservation". African Affairs 90 (358): 5-21. Central Statistical Authority (CSA), 1996. Agricultural Sample Survey1995/96. Report on Agricultural Practices. Statistical Bulletin 152. Addis Ababa. CGIAR/TAC , 1989. Sustainable Agricultural Production: Implication for Internatonal Agricultural Research. Consultative Group on International Agricultural resaerch/ Technical Advisory Committee, FAO Research and Technology Paper 4. Rome. Clay, E. J. and B.P. Schaffer, (eds). 1984. Room for Manoevuvre: An Explanation of Public Policy Planning in Agricultural and Rural Development, Heinemann. London. Coxhead, I. 1996. Economic Modeling of Land Degradation in Developing Countries. Agricultural and Applied Economics Staff Paper No. 385. University of Wisconsin-Madison. Dejene, A. 1990. Environment, Famine and Politics in Ethiopia: A view from the Village. Lynne Rienner Publishers, Boulder. Douglass, G.K. 1984. Agricultural Sustainability in a Changing World Order. Westview, Boulder. Ermias, B. 1989. Inventory of Forest Projects in Ethiopia. Short-term consultancy report to the World Bank. Graaf, J. 1993. Soil Conservation and Sustainable Land Use: An Economic Approach. Development Oriented Research in Agriculture. Royal Tropical Institute, Amsterdam. Grepperud, S. 1996. "Population Pressure and land Degradation: The Case of Ethiopia." Journal of Environmantal Economics and Management, 30(1): 18-33. Hurni, H. 1986. Applied Soil Conservation Research in Ethiopia, Third National Workshop on Soil Conservation in Kenya, department of Agricultural Enginneering, Nairobi University, September 1986. Hurni, H. 1993. "Land Degradation, Famines and Resource Senarios in Ethiopa". In Pimental D, ed., World Soil Erosion and Conservation, Cambridge University Press. Cambridge. IUCN, 1990. World Conservation Strategy: Living Resource Conservation Strategy for Sustainable Development. International Union for Conservation of nature and Natural Resources, United nations Environmental Program, Gland, Switzerland. Lal, R. 1987. Effects of Soil Erosion on Crop Productivity. CRC Critical reviews in Plant Sciences Vol. 5, No. 4. Lele, S. M. 1991. "Sustainable Development: A Critical Review". World Development 19 (6): 607-621. Lewis, L.A. and V. Nyamulinda, 1996. "The Critical Role of Human Activities in Land Degradation in Rwanda". Land Degradation and Development, 7(1):, 47-55. Morgan, R.P.C. 1995. Soil Erosion and Conservation. Second Edition. Longman, Essex. Nijkamp, P., C.J.M. van den Bergh, and F.J. Soeteman. 1991. "Regional Sustainable Development and Natural Resource Use". In Proceeding of the World Bank Annual Conference on Development Economics 1990. World Bank, Washington D.C.
Olson, K., R. Lal, and L.D. Norton. 1994. "Evaluation of Methods to Study Soil Erosion-Productivity Relationships". Journal of Soil and Water Conservation, 49(6): 586-590. Scherr, S. J. and S. Yadev, 1996. Land Degradation in the Developing World: Implications for Food, Agriculture, and the Environment to 2020. International Food Policy research Institute, Discussion Paper 14, Washington D.C.
Southgate, D. 1988. The Economics of Land Degradation, Environment Department Working Paper No. 2., The World Bank, Washington D.C.
Tivy, J. 1990. Agricultural Ecology, Longman, London. Vosti, S. A. and T. Reardon. 1997. Sustainability, Growth and Poverty Alleviation: A Policy and Agroecological Perspective. The John Hopkins University Press, Baltimore. Waktola, A., 1988. "Ethiopian Experience in Soil and Water Conservation". In Proceedings of AAU-DAAD Conference on Problems of Man and his Biosphere. Addis Ababa University, Addis Ababa. World Bank, 1999. World Development Report 1998/99,.Oxford University Press. Oxford. World Commission on Environment and Development, 1997. Our Common Future. Oxford University Press, Oxford. Yohannes Gebremichael, 1998. "Indigenous Soil and Water Conservation Practices in Ethiopia: New Avenues for Sustainable Land Use". In: Blume et al., (eds.). 1998. Towards Sustainable Land Use: Further Cooperation Between People and Institutions. Advances in Geoecology 31, Vol. II. Catena Verlag GmbH, Reiskirchen.